This garlic shrimp is a snap to prepare and cook in a slow cooker. The dish needs very little attention, so it's perfect for a busy day or when you just don't have stovetop or oven space for another dish. The shrimp makes a fabulous appetizer. 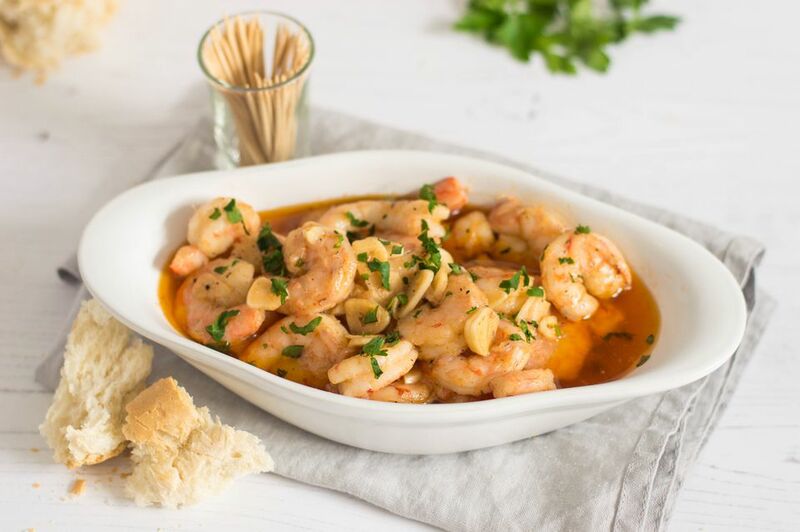 Arrange the shrimp and some of the sauce on a tray with toothpicks and toasted baguette slices. Or serve the shrimp and sauce with hot boiled rice or angel hair pasta. Feel free to vary the seasonings. We used Creole seasoning, but a seasoned salt blend or plain kosher salt, paprika, and a dash of thyme or dried leaf basil would be excellent as well. Drizzle a few tablespoons of lemon juice over the shrimp before serving or serve the shrimp with lemon wedges. See the tips below the recipe for a quick homemade Creole seasoning blend. Combine the butter, oil, sliced garlic, Creole seasoning, and the black and cayenne peppers in the crockery insert of a slow cooker. Cover and cook on HIGH for 25 to 30 minutes. Run a small, sharp knife down the back of each shrimp. Pull the dark-colored vein out or scrape it out with the tip of the knife. Rinse the shrimp under cold running water and pat dry. Repeat with all of the shrimp. Add the prepared shrimp to the slow cooker and stir to coat them with the oil and butter mixture. Cover and cook on HIGH for 20 to 30 minutes, stirring about halfway through the cooking time. The shrimp are done when they are opaque and pink in color. Remove them to a serving dish and pour the sauce over them. Garnish with fresh chopped parsley and serve as an appetizer or main dish. In a bowl, combine all of the Creole seasoning ingredients and mix until well blended. Use in the above recipe. Whatever remains, cover and store in a cool, dark place. ​If the store-bought Creole seasoning is salt-free, add about 1/2 teaspoon of Kosher salt, or to taste.